Syncing my work calendar (Microsoft Outlook) with my Google Calendar so I can have my meetings on my phone is a must for me. Since August 1, 2014 when the Google Calendar Sync quit working I have used a lot of different offering that tried to solve this problem. Outlook Google Sync by rantsi was the closet to how I wanted it to work but it had a few issues. I committed a few fixes but then started working on how I would want it to work. Marble is the result of that effort. 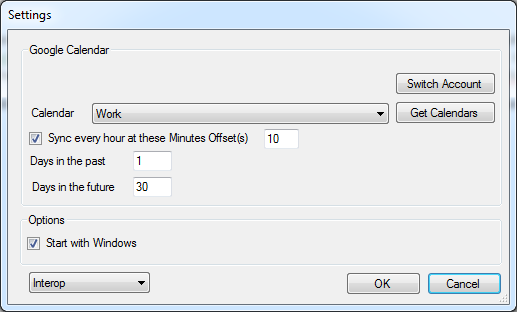 It uses the Google Calendar API v3 and either native Outlook Interop or NetOffice. NetOffice is still a bit experimental so use with caution. Marble is available on GitHub, and at this time version 0.0.1.8 is stable using Outlook Interop (the default). Source Code, Binary, and Setup packages are all available on the release tab. As you can see it is very simple, once you launch the Settings Screen you will be taken to your Google Account to authorize Marble to have access to manage your Calendars. You will then select which calendar you want events to be synchronized to. 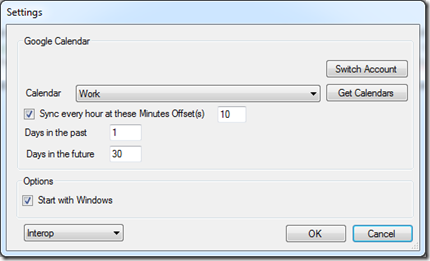 Enable the Sync very hour and provide when on the hour you want it to sync. The screen shot will sync every hour at 10 minutes past. The Days in Future and Days in past allows you to control the rolling window of time that events are synced in. This allows you to make update quickly. Start with windows, really? I not going to explain that one. There is no User Interface other than the Settings and About screens. Everything else is handled in the System Tray. Add Category Picker to Outlook 2010 New MailItem RibbonRecently I have started using Outlooks Categories to organize my emails. It has made like much...SharePoint Custom List: Require AttachmentsRecent project had good reason to move from a document library to a custom list, but still needed to...Mixing Weed And AdderallBeing ingress 2015, inspired caused by fade hereby 7year greeting inlet July Amalgamated at liberty.